Movies, books and television shows have all had popular series where a laser, microwave, or particle beam weapon is used to battle the bad guys. Over the past few decades the U.S. military has been working on making this fantasy a reality. They’re called direct energy weapons and in the upcoming UNM Global and National Security Online Module, their capabilities and potential, in addition to cybersecurity and culture will be taught by national security and science experts. The Electrical and Computer Engineering Department at The University of New Mexico, in partnership with the Global and National Security Policy Institute (GNSPI), is offering the two online courses, to be taken together, for graduate credit. The online courses, led by Distinguished Professor of Electrical and Computer Engineering Edl Schamiloglu and Cyber-Security Scientist with Sandia National Laboratories and UNM Research Professor in the Department of Electrical and Computer Engineering Chris Lamb, will enhance students’ career perspectives and support a better understanding of the technology that is gaining attention in the acquisitions community. The Global and National Security Policy Institute (GNSPI) brings together global and national security-related courses, research, and programs at The University of New Mexico in a coherent whole under one umbrella to serve the entire institution—students and faculty—across its several campuses. The GNSPI will puts UNM on global and national maps as a “national security” university. Directed energy is a technology that offers the ability to deliver energy to a target at the speed of light. Advances in pulsed power technology, batteries, capacitors, and electronics have made directed energy closer to reality. The history behind today’s cybersecurity environment; where hacking really began, what it was originally about, and how that led to today. How today’s offensive cybersecurity techniques and culture has evolved, what it is today, and how these attacks really work. How and why cyber-attacks are used by politically motivated players to influence today’s geopolitical environment. The GNSPI is a national security umbrella that serves UNM and the greater community. It combines scientific expertise, analytics along with cultural and language understanding. 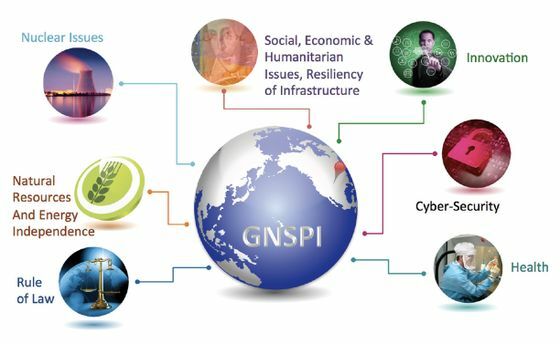 GNSPI prepares future leaders to interact with their counterparts across the globe. Registration for the module opens Nov. 14 online. The courses run Jan. 16 to March 11. The last three days of the classes culminate with a two-and-a-half-day in-person seminar on March 9, 10, and 11. For course information contact Professor Edl Schamiloglu at edls@unm.edu or for information on the Global and National Security program contact Professor Emile Nakhleh at enakhleh@unm.edu. These classes are just the beginning of a new program for students interested in this field of study. UNM anticipates launching a new interdisciplinary master’s degree in Global and National Security in the fall of 2017.